I know this topic has been discussed here and there, but wondering if anyone has any recent experience with wireless security cameras. We’d like to get 2-4 cameras to cover the perimeter of our house. We recently had someone (under the influence of a substance) on our property - turns out he was relatively harmless, but scared us nonetheless. I’d like to get something that I can access remotely, that can store (locally or cloud based) a few days worth of recordings, is motion activated, good night vision, and is easy to use. I’m looking at the Arlo Pro 2 system, or the Zmodo cameras. The Arlo is expensive, but does have rechargeable batteries, an alarm, free 7-day cloud based storage, and two-way voice. I heard it’s very easy to use as well. The Zmodo is cheap, but no alarm, two-way voice, or free storage that I can see. I’m not 100% sold on either of these and am open to suggestions or other models. Do you have a Sam's Club anywhere near? Believe it or not they have had some good deals on wireless. I considered the Ring cameras too Paul, but they seem to be the doorbell or floodlight. Neither will work all that well at our house. We have no doorbells now, and we’ve got a lot of entry points to the house (6 door, and 10 accessible windows). We actually just had Xfinity install their security system. The new package with security, faster internet, and more channels is about the same as we were paying. I opted against their cameras as they were poorly rated, expensive ($200 each) and you have to use their monitoring ($9.95 per camera)! I’d like to have the cameras away from the house pointing towards the house. I may be able to get most entry points with 2 cameras, but ideally would need 3 or 4. We do Ivan. They have the Arlo, but it’s actually cheaper elsewhere. Most of their other systems were wired. And by wired, I mean wired to the dvr. I really like the dropcam which is now nest. Wireless and cloud based storage. High quality product and very high resolution and night vision. Check the arlo pro reviews on costco. Not that great at all. I've been thinking about the Arlo Pro. I like the fact that they're wireless and cordless. You can get a wall wart for em too. I did find this on CL recently. Not the Pro, but looks like a cheap starter set. I have the Arlo Pro, using 2 cameras. I found a good deal using Best Buy's online price which was matched in the store. They offer the Arlo Pro 2 now which wasn't avail when I bought mine. My Pro has very good daylight PQ, decent night PQ, but is only 720P...the Arlo Pro 2 is 1080P. I can see everything, but mounted under the soffits, you wont be able to read a license plate if that's what you're after. They are expensive, but after researching quite a few, they really offer a quite an easy setup with good picture quality and field of view. I would narrow down the Arlo Pro, or Pro 2 and a wired Lorex 2K setup. The Lorex offers very good PQ but more involved to mount and run the ethernet cable. If you need a system to catch something, like you stated, then the Arlo is quick and easy. For a more permanent setup, the 2K Lorex is where I would probably steer. The Lorex fluctuates in price often, just look for deals, especially around black Friday. 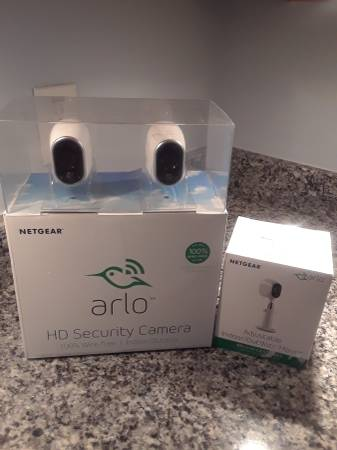 We have the Arlo Pro (1 not 2) and it works great and was very easy to set up. Batteries are rechargeable and last about a month. We purchased from Costco as a package with 3 cameras, base station with alarm, charging station and extra batteries. Costco and Sams Offer package deals from time to time. The only issue I’ve ever had was one camera needing to be re-paired after complete battery drain. There is an Arlo community that helped me figure out the issue and solution. I really like my Arlo system. Does everything I want it to do. Free cloud storage and alerts with no monthly subscription was a big selling point for me. Wondering if those sound like good deals? Is it just me, or does it seem like having to change batteries on a monthly basis would be a pain in the rear. I know if I had a wireless system with battery power, I would have to get a ladder to reach where the cameras would go in order to change the batteries. For me, doing that on a monthly basis would get old real quick. I'm looking at buying just cameras that are PoE (Power over Ethernet) and having those connect through my router to my Synology NAS as the recording device. You can hook up one camera for free and others at a charge with the Synology solution. As I already have the Synology and space, I'm thinking this is the way I may go in the future. I hear ya @GospelTruth but I believe the Arlo Pro’s have the ability to use a wall wart as an option. I have used the Zmodo cameras for about 4 years and they will do the job for basic coverage. The app will send you an alert in real time, they do have cloud storage fairly cheap and without it each alert stays on your phone for 24-72 hours. Coverage at night is good for the money shot (face), but distant is limited unless their is ambient light. The Arlo has a rechargeable battery, if your recording time is short. Around 30 sec per event, you can generally get a month. They are attached by a strong magnet so just take inside and recharge. There is also an option to have them connected 24/7 with an extended length charge cord if you desire. The 2K Lorex is PoE and is a sweet system for a more permanent setup. But the Arlo is super quick and easy, up and running once batteries are charged.